Bridal nails can be anything a nail technician and her bridal client can imagine ... although the designs tend to run to French twists, pink and white combinations, and nail art on the demure and elegant side. 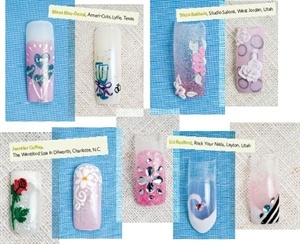 The designs shown here were featured in the June 2010 issue of NAILS. When a bride-to-be chooses you to create her wedding day nail look, it’s important to make the nails complement the overall look and theme of the wedding and reception. What do her invitations look like? What about bridesmaid dresses and accessories? Four nail techs pitch nail ideas to brides based on their wedding schemes. According to TheWeddingReport.com, the average American wedding costs between $22,000 and $26,000. Is your salon getting its piece of the wedding cake, er, pie? It takes targeted advertising, smart scheduling and retailing, superior service, and a referral program, and you’ll be on your way to salon-wedded bliss.